Widespread flooding and mudslides caused by days of torrential rain in Venezuela have killed at least 25 people and destroyed thousands of homes. The latest deaths - four - were reported in the capital, Caracas. A state of emergency is in force in the area that includes Caracas and in three other northern states. The government said more than 33,000 people had already been moved to temporary shelters. Many of the deaths have occurred in poor areas of the capital, where landslides have swept away houses built on steep hillsides. During a visit to one such district - Antimano - President Hugo Chavez called on people still in high-risk areas to move to government shelters until the rains subside. "They told me that you did not want to leave until Chavez came. Well, here I am," he told residents. However, a member of a local community council, Marbella Pimental, told Reuters news agency that relief shelters were already overcrowded and more help was needed. Image caption Much of the devastation has occurred in parts of the capital, Caracas, where landslides have swept away houses built on steep hillsides. "Disabled people, pregnant women and the elderly and sick children have been sent to hotels organised by the community and business leaders, and business owners have made room," she said. Mr Chavez said more than 20 families who have been given shelter at the presidential palace could stay there until they had new homes. He said that he would order buildings inside a military complex in the capital - Tiuna Fort - to be vacated if necessary so people could live there temporarily. National Assembly officials have also said space in parliament could be used as a refuge. More than 5,000 people have already lost their homes and the state of emergency is in force in the states of Miranda, Vargas and Falcon, as well as the capital. Venezuela's state oil company said operations at the Amuay oil refinery in Falcon, which had been suspended due to a power failure on Monday, had resumed. The company said the problems have not affected oil exports, which are a crucial part of Venezuela's economy. The May-November rainy season in the region has been extremely severe this year as a result of a climatic phenomenon known as La Nina. 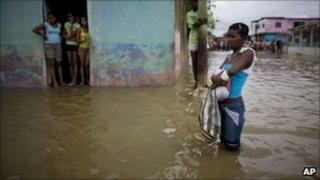 In neighbouring Colombia, more than 160 people are known to have died because of heavy flooding in recent weeks. The government says 1.5 million people have been affected. In December 1999 floods in Venezuela killed up to 30,000 people in the country's worst natural disaster in modern times.